Right-back O’Donnell, who made his debut in May and has now accumulated six caps, missed Kilmarnock’s 1-0 win over Hearts on Saturday. 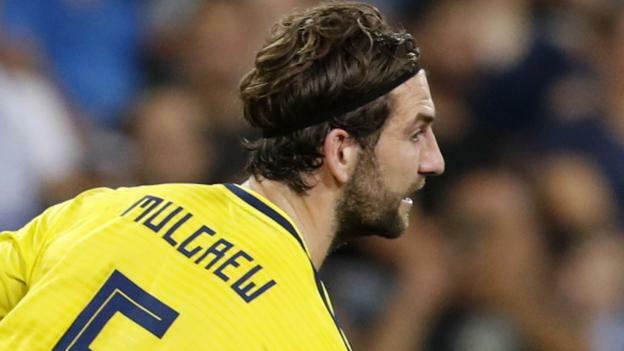 Centre-half Mulgrew missed Blackburn Rovers’ 1-1 draw with Rotherham United. Meanwhile, Fulham midfielder McDonald has been ruled out of Sunday’s game with Liverpool with a hamstring injury. The absences leave McLeish with only five defenders in a squad now whittled down to 20. Three of the fit defenders are left-backs, although Graeme Shinnie plays more regularly in midfield for Aberdeen and Kieran Tierney has played centre-back for Celtic and the national team. The two others are Aberdeen’s central defensive partnership of Scott McKenna and the uncapped Michael Devlin. Callum Paterson could deputise for O’Donnell at right-back but has been in goalscoring form for Cardiff City in an attacking role. Kilmarnock manager Steve Clarke said of O’Donnell: “Stephen is injured. However, Kilmarnock goalkeeper Jamie MacDonald will join the squad despite also being absent from the win over the Scottish Premiership leaders. MacDonald had replaced the injured Jon McLaughlin in McLeish’s squad. Scotland trail Israel by three points in Nations League C, Group 1 going into their final two group fixtures. They will travel to Albania on Saturday, 17 November before hosting Israel three days later. Defenders: Michael Devlin (Aberdeen), Scott McKenna (Aberdeen), Andy Robertson (Liverpool), Graeme Shinnie (Aberdeen), Kieran Tierney (Celtic). Midfielders: Stuart Armstrong (Southampton), Ryan Christie (Celtic), James Forrest (Celtic), Ryan Fraser (Bournemouth), Gary Mackay-Steven (Aberdeen), John McGinn (Aston Villa), Callum McGregor (Celtic), Callum Paterson (Cardiff City). Forwards: Steven Fletcher (Sheffield Wednesday), Oliver McBurnie (Swansea City), Matt Phillips (West Bromwich Albion), Johnny Russell (Sporting Kansas City).